Winnie's Inky Fingers: Thrilled For You! Today I am sharing a card I made for my husband's aunt and family. They relocated to Long Island from Virginia and bought a new home. While looking through my stamp stash, I came across this fun house stamp by recollections. 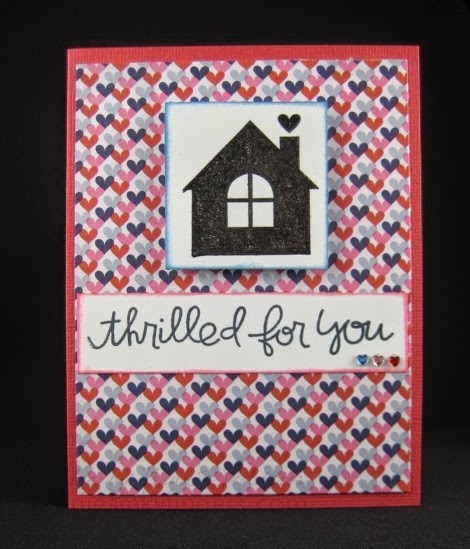 I heat embossed it in black and used some fun heart paper from my Simon Says Stamp card kit. Instead of the usual "Congratulations" sentiment, I went with this one by Paper Smooches, as we really are thrilled for them. This Sunday we were able to visit them in their new home and I learned how to play bocce ball! I seemed to get better as we went along, but still came in last! I married into a bocce-loving family, it seems. Hope you have a fabulous weekend ahead! My husband and I will be working in our basement as we are clearing it out after our flash flood last week. We got it all dry, etc, but so many things to sort through and continue to toss away things we don't need. One fun thing we will be doing is attending a barbecue with some dear friends. Nice design on this card. Have fun at the barbecue as a reward for the basement cleaning! Also..what in the world is bocce ball? What an adorable and charming housewarming card. I'm sure it will brighten the day of those weary folks who have recently moved. Such a cute card. I really like the dp that you used and it's so perfect for this card. Good luck with the cleaning and purging. Sorry about that flood. Why Aren't Winnie's Fingers Inky Lately?